Both rating favorites FM Leif Pressman and NM Nicolas Checa won their first two games in the top quad of this week’s tournament. Pressman won the final round game to win with a perfect 3/3 score! Meanwhile, nothing was clear about the second section, a six player swiss. Daniel Cooper and Leo Bykhovsky led with 1.5/2 going into the final round but both lost their final games allowing Nowell Sheinwald to leap frog into first place with 2/3. 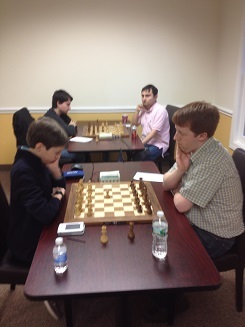 Four players, Daniel Cooper, Vladimir Kotov, Leo Bykhovsky and Robert Steindorf tied for second place with 1.5/3 each.